Lock in a great price for Divani Apollon Palace & Thalasso – rated 8.6 by recent guests! The hotel rooms and services are great, close to the good beach and 2 large swimming pool. Very nice welcome upon arrival special thanks to Ms. Vasiliki. Also check out was smooth and I was giving extra time kindly by Mr. Micheal. Wonderful place. The staff was great and give us an upgrade without asking for it and was so helpful. Sea view was beautiful. The spa is incredible! I got a service from Vasso that was one of the best. My wife got a pedicure that was one of the best. It has a private beach are that is easily accessible. The beach. In the booking, I requested to check in at 2 am (no reply received), but despite that the Hotel found a good solution. Divani offers two lovely pools, one saltwater and one unsalted. The breakfast buffet was fabulous and plenty of space for guests to eat. The staff at Divani is friendly and kind especially the check in staff, bellhops and parking staff. The pool staff is very kind as well and willing to help with chairs, towels etc. Divani has a little private beach but very limited in space but a nice option. It has a convenient tunnel that runs under the street so you do not have to cross the road outside and lovely bathroom facilities by beach. Mythos restaurant offers a beautiful sea setting to enjoy the beauty of the water. Divani Apollon Palace & Thalasso This rating is a reflection of how the property compares to the industry standard when it comes to price, facilities and services available. It's based on a self-evaluation by the property. Use this rating to help choose your stay! One of our top picks in Athens.A 25-minute drive south from downtown Athens, the 7-floor Divani Apollon Palace & Thalasso has a spa centered on thalassotherapy. 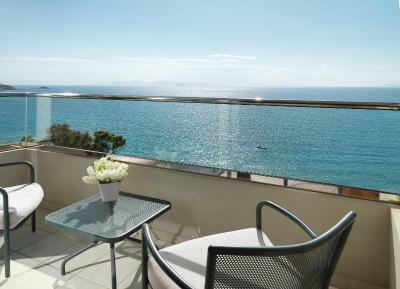 Guests enjoy 3 pools, and a private beach on the Athenian Riviera. A member of The Leading Hotels of the World, the Divani Apollon Palace & Thalasso offers luxurious rooms with furnished sea-facing balconies. Rooms are fitted with designer fabrics, oak furniture and paintings. The fine-dining Mythos by Divani has mostly seafood and an intimate atmosphere. Casual restaurants include Anemos, with buffets and outdoor seating, and Atlantis Lounge and A&D bar, both offering light snacks, signature cocktails and live music. Meltemi Poolside Snack Bar offers a shaded seating area and is open during the summer period. The hotel’s Spa & Thalasso Center is a proud member of the Leading Spas. Facilities include a 225-m² indoor pool, roman baths, 2 saunas, 2 Turkish baths and more. Active guests will enjoy the flood-lit tennis court and jogging route. Waterskiing at the property's private beach is also available. 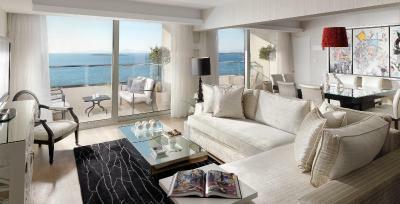 Divani Apollon Palace & Thalasso is 11 mi from downtown Athens. Glyfada, famous for shopping and night life, is only 5 minutes away by shuttle bus. Glyfada Golf Club is easily reached at 1.9 mi. The hotel has a 250-car garage. 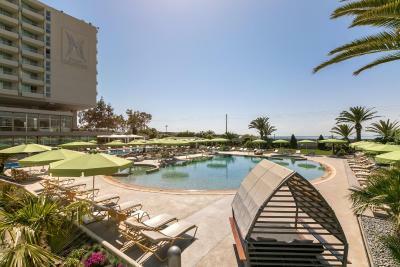 When would you like to stay at Divani Apollon Palace & Thalasso? 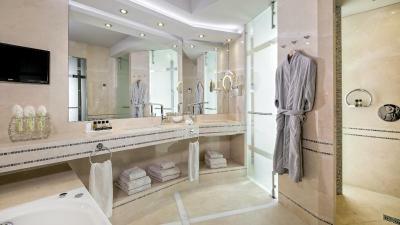 Superior Rooms have luxurious bathrooms. Designer fabrics, oak furniture and tasteful paintings accentuate the décor. Free Wi-Fi is offered. The spacious executive rooms offer complimentary tea/coffee making facility, mini-stereo, weight scales and luxury amenities. The bathroom comes with bath tub or shower. Free WiFi is offered. 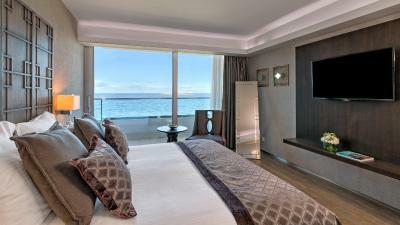 This sea-view suite has a master bedroom, a living room and a bathroom with spa bathtub and TV. Free Wi-Fi is offered. This suite includes a spacious lounge, fully equipped work desk, dining room, bathroom with spa bath, hammam, LCD TV and 2 furnished balconies. Free WiFi is offered. 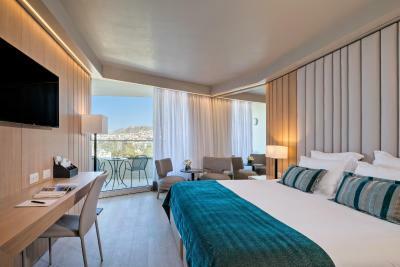 Offering a prime location in the heart of the Athenian Riviera, the Divani Apollon Palace & Thalasso is the perfect place for a memorable stay in Athens. This luxury hotel offers you the only Thalassotherapy center in the Attica region, lavish guest rooms and suites all with stunning sea views, a private beach, outdoor swimming pools, restaurants and bars and extensive business and events facilities. If the loyalty of our guests is legendary, it is also because they can always be sure of finding the same dedicated and attentive staff on every visit. Enjoy a truly magical stay in this exclusive hotel, one of the prestigious Leading Hotels of the World. House Rules Divani Apollon Palace & Thalasso takes special requests – add in the next step! Divani Apollon Palace &amp; Thalasso accepts these cards and reserves the right to temporarily hold an amount prior to arrival. Divani Apollon Palace & Thalasso accepts these cards and reserves the right to temporarily hold an amount prior to arrival. Please note that credit card payments require the card-holder's presence and signature, along with the credit card used for the reservation. Also note that entrance fee applies for the Thalassotherapy center. Booked a quiet room but noisy building work commenced at 8 am! No bath in bathroom basic commodity for 5* accommodation, extra charge of 45 euros each per day to use the spa, restaurants closed during the winter apart from one that opened only on a weekend. The fact that in the photos only the spa pool was displayed (extra charge to access) and not the indoor poor pool which was included in the room price. I visited subject hotel in winter so the indoor pool was a priority for me. The luxury-comfortable room, the view, the breakfast, the very kind staff. The location is good for swimming and enjoying the beach and relax but its not close to center and min 10 min driving to shops and center. Really wonderful breakfast, stunning view, helpful staff, good massage and spa. We were traveling with 2 small kids (2 and 4), the two year old still sleeps with us. But the staff at reception were very rude, requested us to book two connecting rooms because according to them there is no space in one room. How surprised we were to see there was additional sofa/bed in each room. We ended up using one room but had to pay for two! This was really waste of money, very commercially oriented personnel at reception. Warm swimming pool, perfect breakfasts, amazing views and atmosphere. One of the best places. Everything but most of all staff, staff and staff. Bravi and thank you! Your consideration for customers is exquisite. And then, there is the Thalsso pool... But without the staff it would be just an expensive add on. With the professional and helpful and knowledgeable staff it is a real pleasure. The rooms new to be updated the couch in the room was stained and old . The sea view and the great continental breakfast.